I saw Bungubox Sweet Potato Yellow a few times on Instagram, and since I've never tried the brand, I though I would give it a shot. For some reason I thought the brand was spelled Bungbox, not Bungubox, so please excuse the missing u in the writing samples. Sweet Potato Yellow is a mouthful, so for the purposes of this review, I will just call it SPY. I got my sample of ink from Vanness Pens. Sweet Potato Yellow ranges from bright yellow to orange. The ink has a silver-orange sheen when pooled. The sheen reminds me of Sailor Jentle Apricot. Feathering: SPY didn't have any feathering on any of the papers. Show through: SPY had low show through on all of the papers. Bleeding: SPY only bled on Baron Fig paper, and only in nibs larger than fine. Other properties: SPY had low shading and low sheen. The sheen is hard to see if you don't know it's there-it's very subtle. 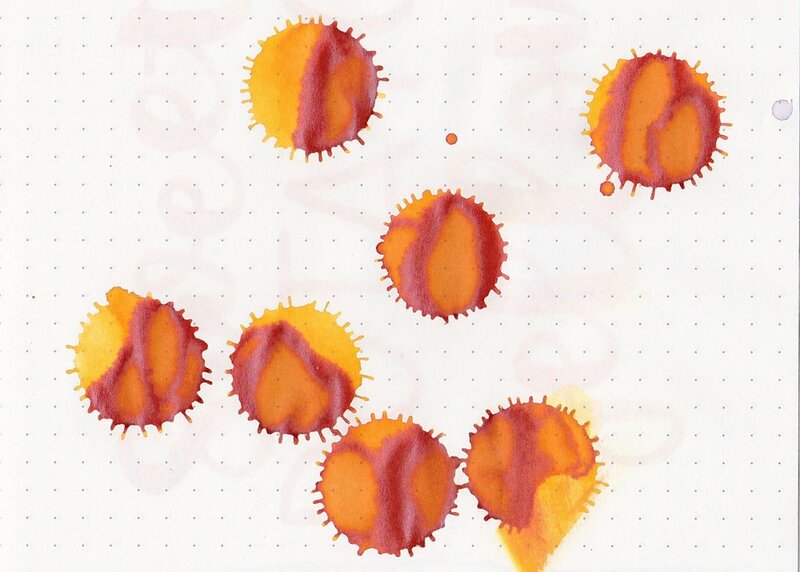 Ink swabs for comparison, left to right (top to bottom for RSS): Sailor Jentle Apricot, Bungubox Sweet Potato Yellow, and Diamine Amber. I included Apricot because its sheen looks similar to SPY's to me, but the color is more orange than SPY. To see the Bungbox inks together, click here. De Atramentis Mahatma Gandhi, Diamine Sunshine Yellow, and Robert Oster Peach. To see yellow inks together, click here. First I tried writing with SPY using a Pilot 912 FA, and then a broad Vanishing Point Twilight, both on Tomoe River paper. Overall, this ink is really well behaved and has a good flow, but it's a bit light for everyday use.